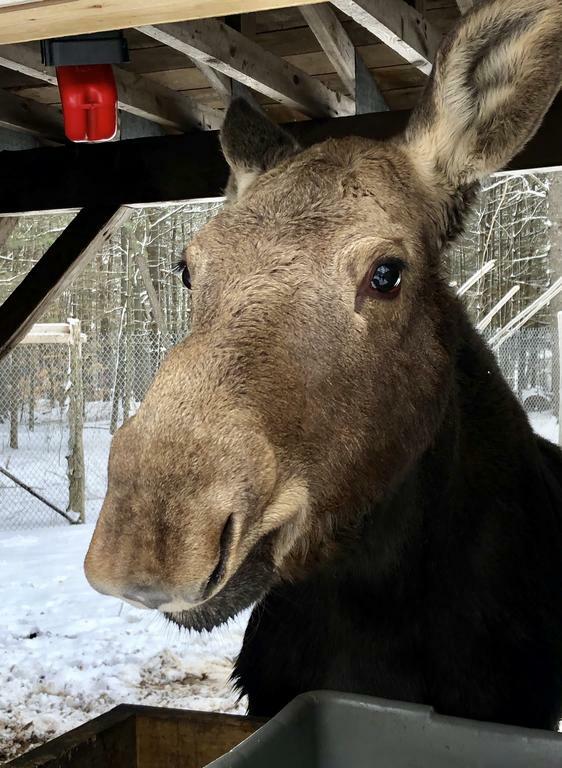 GRAY — Nearly a year after arriving at Maine Wildlife Park in Gray and becoming an instant “sensation,” Maggie the moose is doing well and growing steadily. She arrived at the 40-acre park last June when she was 3 weeks old and weighed about 25 pounds. Now, Maine Wildlife Park Superintendent Curt Johnson estimates she weighs about 400. “We think that the cow was removed from the picture by some sort of accident, maybe she was struck by a car or something like that. We’ll never know,” Johnson said. Maggie, so named by the family who found her, was brought to Maine Wildlife Park, which is run by the Maine Department of Inland Fisheries and Wildlife. Instead of bottles, Maggie now eats “browse,” like the other two moose at the park: the twigs, barks, leaves and buds of younger growth. These species often include maple, birch, aspen and apple. Johnson said the moose also receive a grain as well as special moose treats. She will remain at the park for the rest of her life since moose that have been raised from a young age in captivity shouldn’t be released back into the wild. With such good prospects, Maggie can look forward to many more happy years at Maine Wildlife Park. The park opens for the season on Monday, April 15. It is also celebrating the grand opening of its new songbird enclosure this year. A ribbon cutting ceremony will be held on May 4. Maggie now weighs about 400 pounds, according to Maine Wildlife Park Superintendent Curt Johnson. Maggie has been at the park for nearly a year. Maggie the moose at 3 weeks old, when she arrived at the Maine Wildlife Center.